Tag Archive | "General Mills"
Betty Crocker Super Moist Party Rainbow Chip Cake mix and Betty Crocker Delights Super Moist Carrot Cake Mix has been recalled due to the possibility of E. coli O121 in the flour used in the flavor chips. 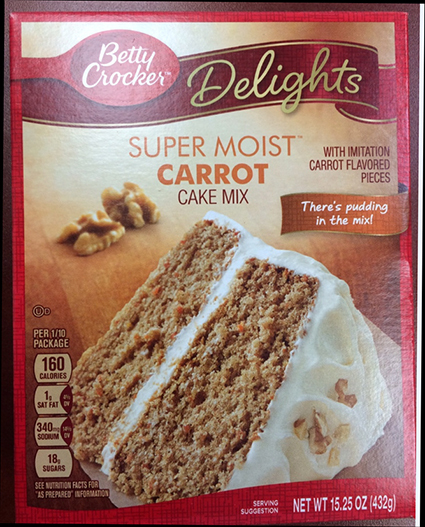 MINNEAPOLIS – Out of an abundance of caution, two flavors of Betty Crocker cake mix sold in the U.S. and one flavor sold in Canada have been added to General Mills’ previously announced flour recall from July 1, 2016. No illnesses reported to date have been connected to cake mix. No other General Mills or Betty Crocker mixes are included in this recall. 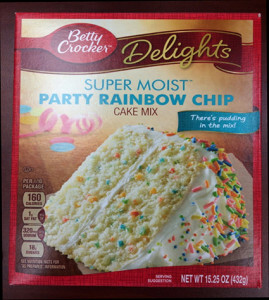 Two flavors of cake mix — Betty Crocker Delights Super Moist Party Rainbow Chip Cake Mix (called Betty Crocker Super Moist Rainbow Bit Cake Mix in Canada) and Betty Crocker Delights Super Moist Carrot Cake Mix — have been added to the recall as they contain flavor chips (or bits) produced using Wondra flour, which was included in General Mills’ previous July 1 recall announcement. General Mills continues to collaborate with health officials to investigate a multistate outbreak of E. coli O121 connected to several brands of flour. If you possess any products included in this recall, they should be thrown away. A full list of retail products included in the flour recall can be found at http://www.generalmills.com/flour. Although most strains of E. coli are harmless, others can make you sick. E. coli O121 is a potentially deadly bacterium that can cause bloody diarrhea and dehydration. Seniors, the very young, and persons with compromised immune systems are the most susceptible to foodborne illness. Anyone diagnosed by a physician as having an illness related to E. coli O121 is also urged to contact state and local public health authorities. U.S. consumers with questions or requesting Betty Crocker replacement product should contact General Mills at 800-230-8103. Canadian consumers with questions about the Betty Crocker products including in the recall, or requesting replacement, should contact General Mills Canada at 800-526-4579. Additional recall information can also be found at http://www.generalmills.com/flour. “The company was notified by our supplier that their product, a blueberry nugget, is made with a small percentage of affected flour which was recalled by General Mills because it may be contaminated with E. coli O121. This is an isolated issue, and only affects specific lots of Krusteaz Blueberry Pancake Mix. Food Safety is our highest priority and this has caused us to take action for the safety of our consumers,” stated the company in a press release. Most strains of E. coli are harmless, however, others can make you sick. E. coli O121 is a potentially deadly bacterium that can cause bloody diarrhea and dehydration. People who experience these symptoms should seek emergency medical care immediately. The very young, seniors, and those with compromised immune systems are the most susceptible to foodborne illness. Anyone diagnosed by a physician as having an illness related to E. coli 0121 should contact state and local public health authorities. No illnesses have been reported to date from the pancake mix. FDA and the Centers for Disease Control (CDC) continues to warn that consumers should refrain from consuming any raw products made with flour. E. coli O121 is eliminated by heat through baking, frying, sautéing or boiling products made with flour. All surfaces, hands and utensils should be properly cleaned after contact with flour or dough. Product was distributed nationwide where consumers purchased product through retail stores. 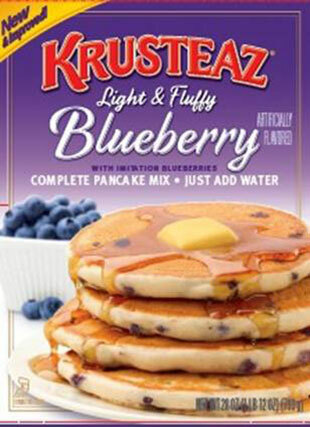 If you have recently purchased Krusteaz Blueberry Pancake Mix 28 oz. carton with a best by date code between 3/30/2018 and 6/16/2018, and a UPC code 041449001289, please contact our Consumer Relations Team at 1-800-457-7744 for information to receive a full refund. Please dispose of the product. 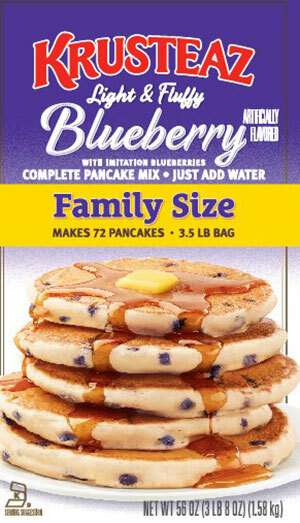 If you have recently purchased Krusteaz Blueberry Pancake a 3.5 lb. bag, with a best by date code between of 4/27/2018 to 4/28/2018, with a UPC code 041449001487, please contact our Consumer Relations Team at 1-800-457-7744 for information to receive a full refund. Please dispose of the product. “The quality and safety of our products is of the utmost importance and we are doing everything possible to ensure our customers have all of the pertinent information,” said Andy Heily, Continental Mills’ president. 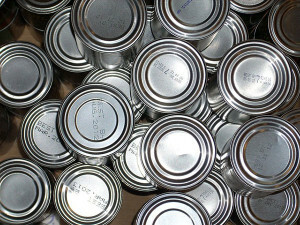 Chemicals in the linings of most food cans may be dangerous to consumers, according to WEB-BPA study Buyer Beware released jointly by six nonprofit groups. They tested nearly 200 cans from 19 states distributed to some major retailers by producers, including Campbell’s, Del Monte and General Mills. “Studies have linked exposure to BPA to breast and prostate cancer, infertility, diabetes, obesity and other serious health problems on the rise,” he said. Just two days before the report was released, Campbell’s announced it will be packaging all its products for sale in the United States and Canada in BPA-free cans by mid-2017. “We found other toxic materials like PVC plastic and styrene-based resins in the can linings of many popular brands,” he noted.